Sometimes we need to atone for our sins. Perhaps you spent a weekend bending your plastic with some serious shopping, inhaled an inordinate amount of the alcohol variety, spent the better part of your Sunday in a horizontal position watching The Office or consumed your body weight in vanilla crunch ice cream. I may or may not have indulged in most of these activities over the past two days. If you follow my tweets, you probably have a pretty good idea of what went down this weekend. Suffice to say that I felt it fitting to present you with this wholesome lentil-y dish to atone for my sins on this stark Monday morning. 'Cause life's all about balance you know? 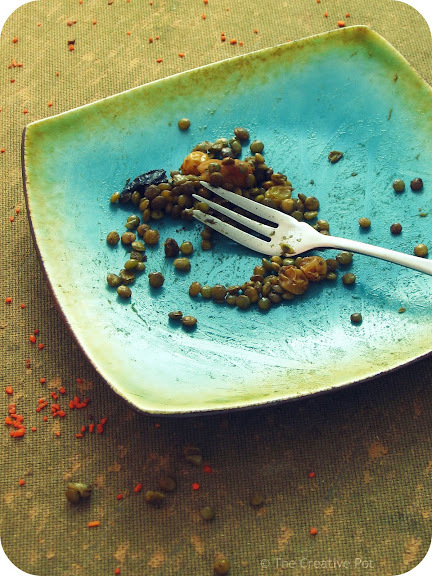 Luckily for you (and me) this isn't one of those boring bland lentil meals. 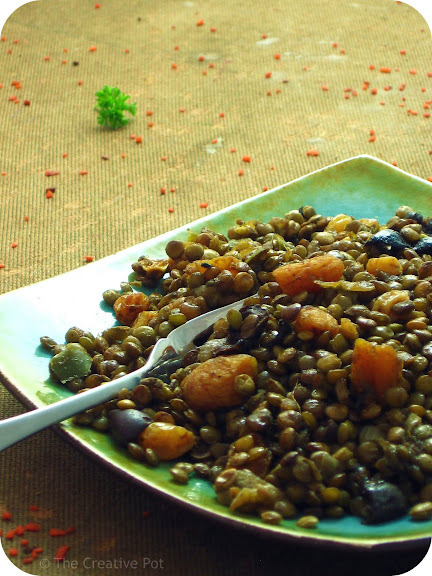 While it may appear all holier-than-thou at first glance, these marrakech lentils features an intriguing mix of spices, salty olives, tart apricots and sweet-like-sugar yellow sultanas. So you can appear all innocent on the outside, but still live the high-life. Win-win, right? Side-note: No, I did not actually whip this up on the weekend. I did however have the leftovers in the fridge and let me tell you, I dove into that like a crazy woman yesterday. My sinful side enjoys leftovers, okay? 1. Heat coconut oil in a large saucepan over medium heat. Add onions, frying gently until softened (5 - 8 minutes). 2. Add ginger, cumin, paprika, allspice, cinnamon, apricots and sultanas and fry another minute or two until fragrant. 3. Add parsley and lentils and stir to coat in oil and spices, then add vegetable stock, turn heat up and bring to the boil. 4. Turn heat down, partially cover and allow to cook over low heat for 25 minutes. Add chopped olives, stir through and cook another 10 - 15 minutes or until cooked through. Did you use your lightbox for these photos? looks great! Love all the Moroccan flavors! Colleen - Lentils are awesome, aren't they? 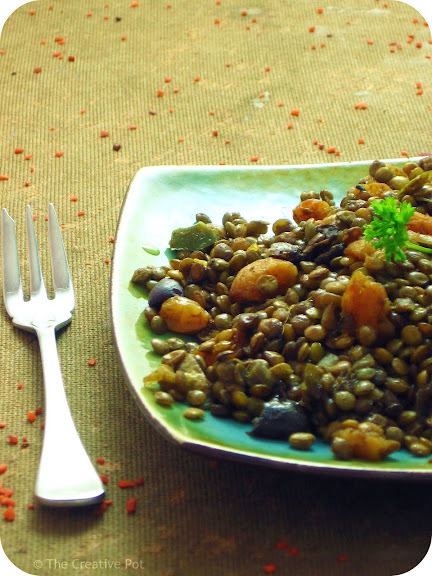 Joanne - You are definitely in need of some lentil cleansing, especially after those brownies you posted the other day. this sounds wonderful. I love the spice combination and the sweet and salty flavors.